Spaghetti squash is an ingredient you may have heard of recently. This versatile vegetable is a winter squash that has flesh fall away in ribbons when cooked. One popular preparation is to use it as a low carb substitute for pasta. Check out 9 Tasty Spaghetti Squash Recipes. 2. Cut the squash in half lengthwise; remove and discard seeds. Place squash on a baking sheet. Bake until tender, about 1 hour. Separate the strands of squash with a fork and place in a medium bowl; discard shells. Maintain the oven temperature. 3. Heat butter and oil in a large saucepan over medium heat. Add onions and cook about 2 minutes. Stir in flour. Reduce heat to low and cook, stirring continually 3 – 4 minutes. 4. Add milk and chicken broth and continue whisking, raising heat to medium-high until it comes to a boil and becomes smooth and thick, about 2 minutes stirring; season with salt and pepper. 5. Once it becomes thick, remove from heat, add cheddar cheese and mix well until cheese is melted. Adjust salt and pepper to taste, add cooked spaghetti squash and baby spinach, pour into a baking dish and sprinkle Parmesan cheese on top. Bake until bubbly and golden 25 to 30 minutes. 2. Chop off the top portion of the garlic head to reveal cloves. Peel any excess paper/skin off from the bulb of garlic. Pour about a teaspoon of olive oil on top the garlic cloves and cover with foil. Roast in a baking dish for 45 minutes, or until golden brown and soft. Allow to cool and then squeeze garlic out of the paper skin into a small bowl and mash well with a fork, set aside. 3. At the same time roast the squash. Slice the squash lengthwise and rub a drizzle of oil all over the cut side of both squash halves and sprinkle with salt and pepper. 4. Place cut side down on a baking sheet and bake about 30 to 45 minutes, or until the squash is just tender enough to scrape into strands. You want it to be barely tender, it will continue cooking later. Remove from the oven and scrape the squash into strands. 5. Reduce the oven to 350 degrees. 6. While the squash bakes make the sauce. In a large skillet, cook 1 tablespoon of olive oil and the pancetta over medium heat, stirring, until the pancetta is lightly browned, about 5 minutes. Add the onion, bay leaf, thyme and sage and cook, stirring until the veggies are softened, about 5 minutes. Push to the veggies to the side of the pan. Increase the heat to medium-high. Add 1 tablespoon olive oil to the center of the pan and crumble in the chicken sausage and cook without stirring for 3 minutes. Break up the meat and continue to cook, stirring occasionally until well browned, about 3 minutes. 7. Add the tomatoes, basil and 1 cup water to the skillet. Simmer, stirring occasionally until thickened, about 15-20 minutes. Once the sauce has thicken a bit, discard the bay leaf and season with salt and pepper. Remove from the heat and stir in the mashed garlic. 8. Meanwhile, in a medium saucepan, melt the butter over medium heat. Add the flour and cook, whisking constantly, for 1 minute. Whisk in the milk in a steady stream and simmer for 2 minutes, whisking throughout. Remove from the heat, stir in all of the provolone and season with nutmeg, salt and pepper. Let cool, stirring occasionally to prevent a skin from forming. 9. To assemble the boats, remove a little of the squash strands from each boat. Then place a layer of the meat sauce on top of the remaining strands, then a layer of the cheese sauce, then layer the removed squash strands on top of the cheese and divide the remaining meat sauce among the boats. Lastly, top with the remaining cheese sauce and shredded mozzarella cheese. Place the squash on a baking sheet and bake for 20-30 minutes at 350, or until the squash are warm throughout and the cheese is browning. Remove from the oven and let sit 5 minutes. Garnish with fresh sage, fried sage or basil. 2. 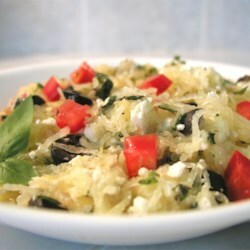 Place spaghetti squash with cut sides down on baking sheet, and bake 30 minutes. Remove squash from oven and set aside to cool. 3. Heat oil in a skillet over medium heat. Cook and stir onion in oil until tender. Add garlic; cook and stir until fragrant, 2 to 3 minutes. Stir in tomatoes and cook until tomatoes are warmed through. 4. Use a large spoon to scoop the stringy pulp from the squash and place in a medium bowl. Toss with the vegetables, feta cheese, olives, and basil. Serve warm. 1. Place squash halves, cut sides up, in a microwave-safe bowl. Microwave at HIGH 20 minutes or until tender. Let stand 10 minutes. Scrape inside of squash with a fork to remove strands to measure 4 cups. 2. Heat a large skillet over medium-high heat. Add spinach to pan; cook 2 minutes or until spinach wilts. Place squash and spinach on a clean dish towel; squeeze until barely moist. Coarsely chop squash mixture, and place in a large bowl. Add panko and next 4 ingredients (through baking powder), and toss well to combine. Place egg whites in a medium bowl; beat with a mixer at high speed until soft peaks form. Gently fold egg whites into squash mixture. 3. Fill a 1/4-cup dry measuring cup with squash mixture. Invert onto work surface; gently pat into a 3/4-inch-thick patty. Repeat procedure with remaining squash mixture, forming 10 patties. Heat a large nonstick skillet over medium heat. Add oil to pan to coat, and cook patties a few at a time. 4. Combine mayonnaise and remaining ingredients in a small bowl. Serve with fritters. 1. Preheat oven to 375 degrees. In a small pot, bring broth, milk, and garlic to a boil over medium-high and cook 1 minute. Pour into a medium bowl, then slowly add flour, whisking constantly. 2. In pot, melt butter over medium. Add anchovies and 2 teaspoons sage and cook, stirring, 1 minute. Return broth mixture to pan, bring to a simmer, and cook until thickened, 6 minutes. Discard garlic. 3. Add squash to sauce and season with salt and pepper. Transfer to a 2-quart shallow baking dish. 4. In a small bowl, combine 1 teaspoon sage, breadcrumbs, and Parmesan and sprinkle over squash. Bake until top is golden brown and mixture is bubbling at edges, 20 to 25 minutes. 2. Halve the squash lengthwise and scoop out the seeds with a spoon. Set the squash halves cut-side-up in a baking dish. Drizzle them with olive oil and sprinkle with sea salt. Bake until fork tender, 35 to 40 minutes. Remove from the oven and use a fork to separate the flesh into strands. Transfer the squash “noodles” to a medium mixing bowl. Set aside. 3. Heat 1 tablespoon of the olive oil in large skillet over medium-low heat. Add the garlic and cook until lightly browned, 2 to 3 minutes. Add the broccoli and cook another 8 minutes, or until tender. Stir in the oyster mushrooms, rosemary, thyme and red pepper flakes, and cook 3 minutes more. Add the cherry tomatoes and green olives, and cook for a final 2 minutes. 4. Transfer the mixture to the bowl with the spaghetti squash. Add the remaining 1 tablespoon olive oil and toss to combine. Season with salt and pepper. Garnish with the pine nuts and serve immediately. 2. Slice spaghetti squash in half and remove all seeds with spoon. 3. Place spaghetti squash face down on large baking sheet, add ½ cup water and cover with foil. 4. Cook spaghetti squash for 45 mins. 5. While spaghetti squash is cooking, mix together remaining ingredients (except cheese) in a large bowl. 6. Make 2 tbsp size meatballs with hands and place on a greased cookie sheet. 8. Remove turkey meatballs from oven, and place into a pan with sauce, warm sauce thoroughly. 9. Remove spaghetti squash and scrap insides. 10. 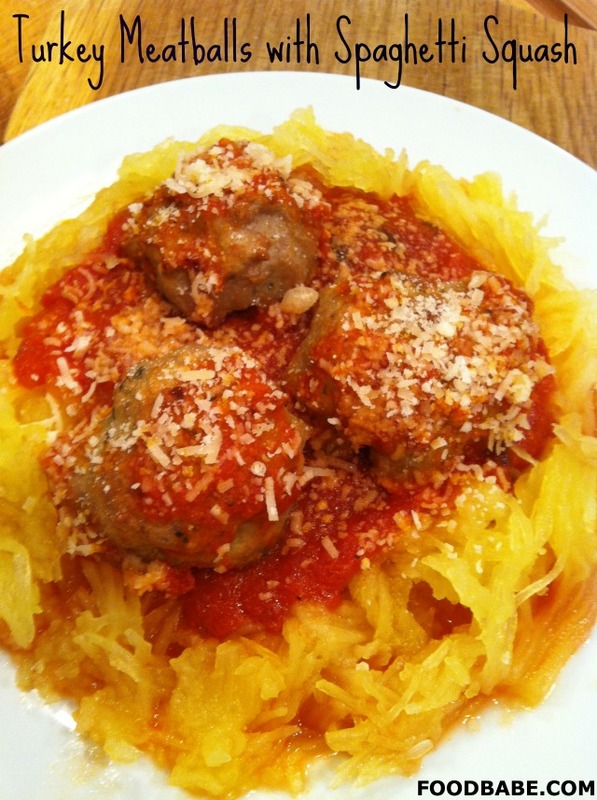 Place spaghetti squash in a bowl and pour sauce and meatballs on top. 11. Sprinkle with Parmesan cheese. 2. Heat oil in large pan; cook onion, garlic, carrot and celery, stirring often until onion and celery are clear. 3. Add hamburger and cook until no pink remains. 4. Drain, then add sauce, and oregano and simmer, covered, about 15 mins or until mixture has thickened slightly. 5. While beef mixture is simmering, cut the squash in half and carefully remove the seeds. 6. Be sure to cut around the edge so you don’t cut into the squash itself. 7. Place face down in microwaveable casserole dish, add 1 inch of water and cover. 8. Microwave on high for approx 10 minutes, or until it begins to soften. 9. Let cool and carefully remove inside of squash with fork or spoon. 10. Let squash strands drain well. 11. Stir spaghetti squash into beef mixture, then spoon into an ovenproof dish and sprinkle with cheese. 12. Bake uncovered, for 15 minutes or until browned slightly. 13. Top with Parmesan and season with salt and pepper to taste. 1. Preheat to 400 degrees. Cut the spaghetti squash in half. Scrape out the seeds and guts using a spoon, and sprinkle the cut sides with olive oil. Season with salt and black pepper. Place the squash cut side down on a baking sheet and roast until tender and easily pierced with a knife, about 45 minutes. When the squash is done, use a fork to scrape out the flesh of each half into noodles.Drain noodles. 2. Peel and shred carrots. Thinly slice one half red pepper. Mince 4 cloves garlic. Thinly slice 4 green onions. In a small bowl, beat together two eggs. Separately, thinly slice 1 green onion and chop about ½ cup of fresh cilantro. 3. In another small bowl, mix together the sauce: mix 3 tablespoons sweet chili sauce, 3 tablespoons soy sauce, juice of ½ lime, and if desired, a few squirts of sriracha. 4. When the squash is ready, in a large skillet heat 2 tablespoons peanut oil over medium high heat. Add the garlic and scallions cook until fragrant. Pour in the eggs and scramble until almost cooked. Add the red pepper, carrots, 1 cup bean sprouts, and squash noodles. Add 3 pinches salt and toss. Add the sauce and stir to combine. Cook about 2 minutes, until the vegetables are heated through but still crisp. 5. Garnish with plenty of crushed peanuts, fresh bean sprouts, and chopped cilantro and green onion.